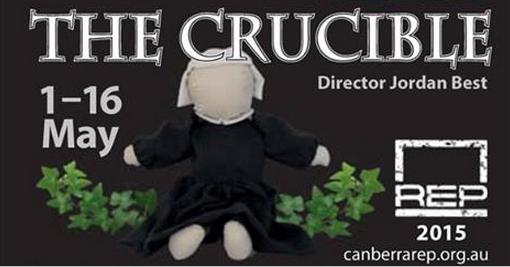 The first production for REP’s 2015-16 Season—and the second for 2015—is Arthur Miller’s The Crucible. Opening on 1 May, the production continues until 16 May 2015 at Theatre 3, 3 Repertory Lane Acton. This Classic drama directed by Jordan Best presents a powerful and timeless depiction of how intolerance and hysteria can intersect and tear a community apart. This is Best’s second directorial role with REP, previously directing Robert Harling’s Steel Magnolias at Theatre 3 in 2014. Join the REP Company at Theatre 3, where you will be transported to 17th Century Salem and let the unraveling begin!